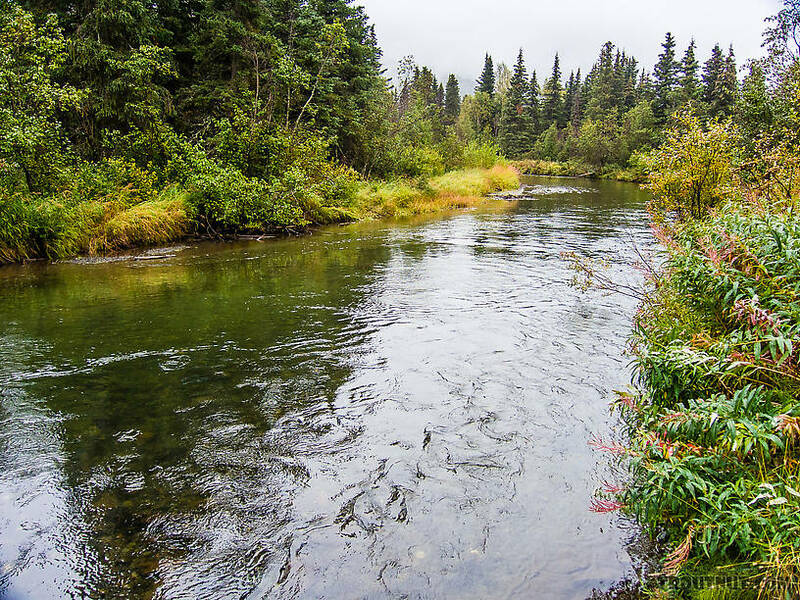 This was Day 4 of a five-day, father-son fishing trip to south-central Alaska. After a good night�s sleep at the Ocean Shores Motel in Homer, Jason and I packed up and went downtown to get a late breakfast. Homer Fish Processing did an excellent job vacuum sealing and freezing all our fish into 1-pound packages, so we put Jason�s fish into his cooler and arranged to have my fish shipped home. We stopped at a gift shop in Homer and toured the Oceans and Marine Visitor�s Center, which had some interesting displays and information about the Maritime Refuge system in Alaska. By noon we had checked out of the motel and were headed back north, stopping only briefly to check out Quartz Creek (photo below) and enjoying the scenery along the Kenai River near Cooper Landing. We stopped at the new Cabela�s store in Anchorage, which had lots of impressive taxidermy and two big aquaria (one for unsociable rainbow trout only, and another with Dolly Varden, round whitefish, and Arctic grayling). Back on the road, we stopped for supper in Wasilla. We called ahead to the Swiss Alaska Inn in Talkeetna and had them leave the key in the door to our cabin in anticipation of our late arrival (~10:30 p.m.). The cabin was very clean and comfortable. Posts: 1 If you head to this area again it is excellent during the middle of the week in the first two weeks in August and then again in later September if it hasn't frozen over.